This week the beautiful simply Hannah modelled her favourite pieces so far this season – and doesn’t she look dreamy?! First up she chose the super sassy belted batwing dress, an elegant and easy piece that hits all the right spots. Here Hannah is wearing with a pair of strappy bamboo soled sandals but you could also team it with stockings and boots or a skyscraper heel… super foxy!! The wonderfully fluid yet structured fabric gives wonderful lines and delightful draping. Sigh. Next she wore a fantastic combination of heavy knitwear, studded belt, soft fluid full length skirt and heavy biker boots. A look that deserves to be in every womans wardrobe – striking, comfy, cozy and oh so easy to wear. ‘Nuff said. Hannahs last outfit of the day is another day to day staple. 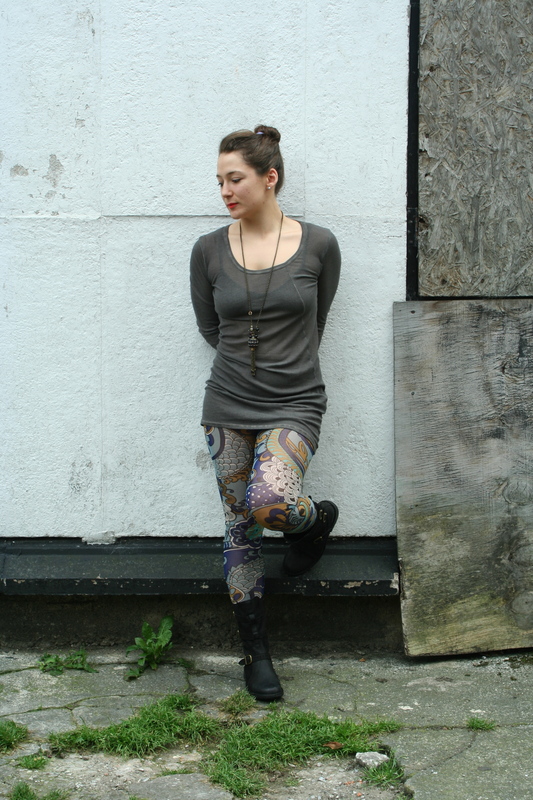 Featuring some trade mark crazy pattern leggings, a wonderfully tactile wear with everything in every-way long sleeve tee and some heavy boots, Our girl Hannah is basically set for Autumn! !